Miami Dade College Foundation raised a grand total of $228,543 on I AM MDC Day, the annual day of giving and pride held on Sept. 6. All donations directly support scholarships and programs. Student scholarships will be announced in October. September 6, marks the first day of classes when the college opened its doors in 1960 with 1,428 students. I AM MDC Day celebrates that day and the College’s tradition of providing educational opportunity to generations of South Floridians with an open door to excellence and innovation. Celebrations began with City of Miami City Commissioner Frank Carollo officially proclaiming Sept. 6 as I AM MDC Day in Miami. 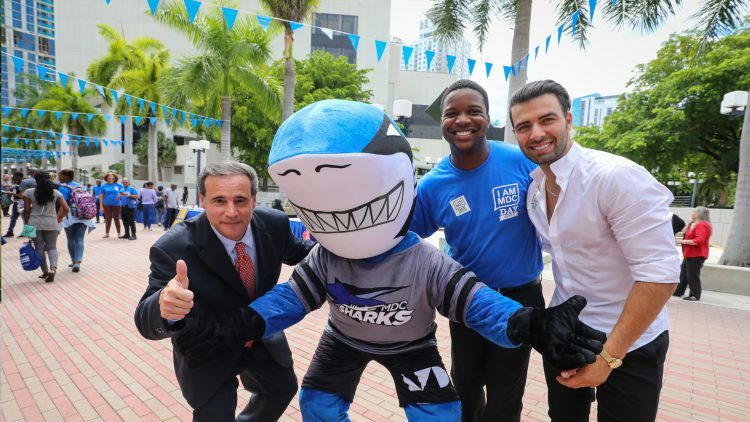 The kickoff ceremony also included remarks from students, MDC’s President Dr. Eduardo J. Padrón, and MDC alumnus and renowned singer Jencarlos Canela. “I want to thank MDC for allowing me to be in a space that prepared me, that gave me knowledge, and that surrounded me with amazing people that inspire me and helped me be the man and professional I am today,” said Canela, who during the ceremony was officially named an ambassador of Miami Dade College. I AM MDC Day encouraged the community to show their MDC pride by wearing blue on Sept. 6, joining the conversation on social media with the official hashtag #IAMMDC, and making a gift online to support students. Following the opening ceremony, activities took place throughout the day across MDC’s eight campuses. MDC’s National Landmark Freedom Tower was illuminated in blue at sunset. Organized by MDC Foundation, the giving day raised more than three times the amount of money raised in 2016. Community and corporate support was impressive. The first $50,000 in donations was matched dollar for dollar by lead sponsor Bank of America. Additional I AM MDC Day sponsors included Geico, Starquix, Shutts and Bowen, VIA Design Studio, South Florida Educational Federal Credit Union, Off The Grille, The New Tropic, and Lulu’s Ice Cream. From its humble beginnings, MDC has grown to be the largest and most diverse campus-based institution of higher education in the nation, with an enrollment of more than 165,000 students and more than two million alumni.